Driving To The Glory of God. . . National Teen Driver Safety Week. . . I spotted a news story this morning. . . one of those stories that I typically glance over. My lack of attention is due to the glut of days, weeks, and months that are dedicated to a host of causes. . . most of them honorable and worthy causes for sure. But for me, this overloading contributes to the habit of overlooking. Still, when I saw the story reminding us that this week is “National Teen Driver Safety Week,” I did pay attention. You see, yesterday, Lisa and I saw police and emergency personnel picking a crumpled motorcycle up off the interstate as we passed by. I don’t know the age of the driver, but it did serve to remind me of the hazards related to driving. Then, this morning, I read an article on a local 19-year-old who was ejected from his car and lost his life in a crash yesterday morning. 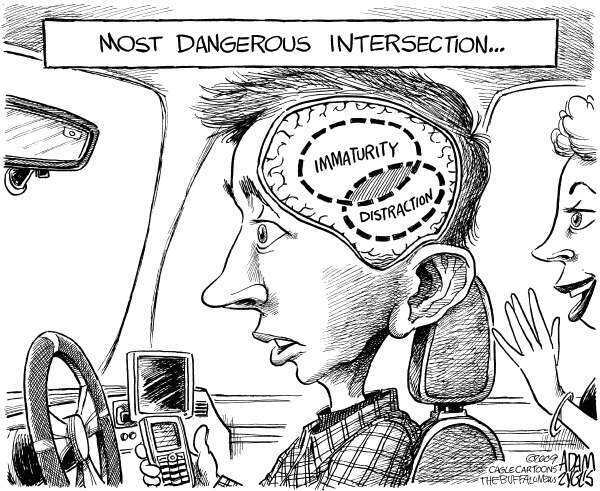 I’m glad I’m not a teen navigating the complexities of gaining driving experience in today’s world. I spent my late adolescent years navigating the privilege of driving without the benefit of wisdom, care, and a well-functioning frontal lobe. In other words, I did a lot of stupid and risky things. 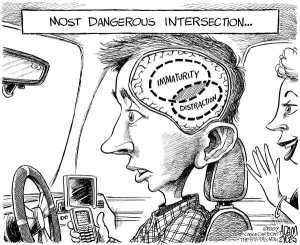 I think about today’s kids and the distractions of cellphones. Again, glad I didn’t have a cellphone to make me even more distracted than I already was. So, this is our world. Kids learn to drive. Many of them very responsibly. Some of them not. All of them lack experience. Our responsibility is to prepare all of our kids for the time they spend behind the wheel on the road, and monitor that time when they’re out there. And, if Jesus is truly the Lord of all of life, we need to communicate that the way they choose to drive will either bring glory to God, or it will advance the kingdom of the enemy. . . akingdom that’s all about undoing human flourishing. I know that parents typically go out of their way to be sure their kids are exercising wisdom, restraint, and caution when they’re behind the wheel. Today, I want to encourage youth workers to fire off a message to the kids under their care. . . a message of challenge that’s filled with wisdom. Send a message that encourages each of them to drive. . . yes drive. . . to the glory of God. ← Desperation and Depth. . . Why Our Youth Group Kids Need Us To Pray They Have Difficulty. . .